Western hemlock, Tsuga heterophylla, (Raf.) Sarg. Mild, humid climates with frequent fog and precipitation during the growing season are preferred. Also occurs in subhumid areas, but is limited to northern aspects and moist microsites such as seepages and stream bottoms (Silvics of North America 1990). Low to medium elevations (Pojar and MacKinnon 1994). Lower elevation moist forests of the western Cascades; wet benches, terraces, and lower slopes at low elevations (FEIS database). Occurs on fairly dry to wet sites where it grows on humus and decaying wood; western hemlock can also grow on mineral soils (Pojar and MacKinnon 1994). A colonizing species on many sites (Silvics of North America 1990). Commonly a late successional species; very shade tolerant (Pojar and MacKinnon 1994). 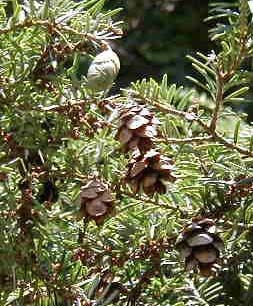 Western hemlock may be grown from seed or by layering or cuttings (Silvics of North America 1990). Seeds are usually fully ripe by mid to late September, although cone scales do not open until late October (Silvics of North America 1990). Seed propagation is recommended. After cool, moist stratification, surface sow seeds and maintain greenhouse temperatures at around 20° C (68° F) (Luna et al 2001). To propagate by cuttings, use rooting hormone, water by misting and apply bottom heat (Luna et al 2001). Seeds, container grown plants from seeds or cuttings. Bare root material is less successful than container grown material (Silvics of North America 1990). Water regularly through the first two growing seasons following installation. Initial growth is slow; 2-year-old seedlings are commonly less than 20 cm (8 in) tall. Once established, seedlings in full light may have an average growth rate of 60 cm (24 in) or more annually (Silvics of North America 1990). Luna, Tara; Evans, Jeff; Wick, Dale. 2001. Propagation protocol for production of container Tsuga heterophylla (Raf.) Sarg. plants (172 ml conetainers); Glacier National Park, West Glacier, Montana. In: Native Plant Network. URL: http://www.nativeplantnetwork.org (accessed 13 April 2003). Moscow (ID): University of Idaho, College of Natural Resources, Forest Research Nursery. Pojar, Jim and Andy MacKinnon. 1994. Plants of the Pacific Northwest Coast: Washington, Oregon, British Columbia and Alaska. Lone Pine Publishing. Redmond, WA. Packee, E. C. 1990. Tsuga heterophylla. In: Silvics of North America, Volume1, Conifers. Agricultural Handbook 654. U.S. Department of Agriculture, Forest Service, Washington, D. C. URL: http://www.na.fs.fed.us/spfo/pubs/silvics_manual/Volume_1/tsuga/heterophylla.htm (accessed on 13 April 2003).